This is the best of the bbq trucks that comes to 20 Mass. For the meat itself, they do an excellent job (tender, flavorful, not too fatty), with a variety of sauces that should appeal even to the purists. They also have delicious, delicious! sides. The black bean salad is great, as is everything else I've tried. This is where they really stand above the competition - no one else has both the bbq and the side dishes. Highly recommend. There BBQ is the beast I've had in yr.'s .I would eat there again. Pulled pork tasted salty and too porky. Glad I put extra bbq sauce or it would have been inedible. Not enough brine and way too much pork flavor. And the bacon mash potatoes were digusting. Will not be going back. Not sure what happenned - I usually love this truck but today I got the Rib which had one rib section which was very tough and flavorless and the other section was hug piece of FAT. The pulled pork was very greasy and tasteless. Very dissapointed - would have taken it back but it was toooo hot out today. I ordered the 2 meat picnic plate with pulled pork and brisket with corn and cole slaw. Everything was great. the meat was tender and had a lot of flavor. I didn't even add extra sauce and i was still satisfied. I liked that corn had chopped onions. I think i will try that next time i make it. The only thing that was just okay for was the cole slaw. I'm used to the mayo and vinegar style slaw. Overall i was satisfied with the food and the service was very friendly. This was my first time buying from a food truck and i will definitely be back. Last year the food was pretty outstanding. Often times I would visit this truck for the sides which I loved, however, today I had corn and beans and the corn was terrible. I can tell they changed the recipe for the corn and for the corn muffins, which seem to have spices in them now. Please go back to using the old recipes or make sure the cook isn't trying to put their own flare on what you were doing, which again was outstanding. I may not return because as of now, I'm truly disappointed. It was okay...the pulled pork was too salty and barely had any bbq sauce on it. I could have done w/o the beans, but surprisingly the corn was pretty good. I'm not a fan of peppers and onions, but I really enjoyed it. The corn bread was probably the BEST out of my entire meal. Just left truck, sitting at my desk marveling over this outstanding lunch. The pulled pork is totalling tender with a perfect hint of smoke and balanced with sweet and slightly spicy bar-b-q sauce, same for the chicken. Although I realize that I don't like brisket, it is very tender and perfectly seasoned. The potato salad if fine (I am a Southern Style gal) BUT the corn was an unexpected PLUS - DELICIOUS! Tastes like the kind I used to have at Sunday Dinner! Perfect Affordable Lunch - THANKS! It was plenty of food. The sandwich was decent sized however I thought the meat was a little salty and dry. It wasn't horrible, and the sauce was good. The potato salad was a "warm" potato salad, which was unexpected. Still it was nice and spicy and made a good side even though it was loaded with bacon grease. 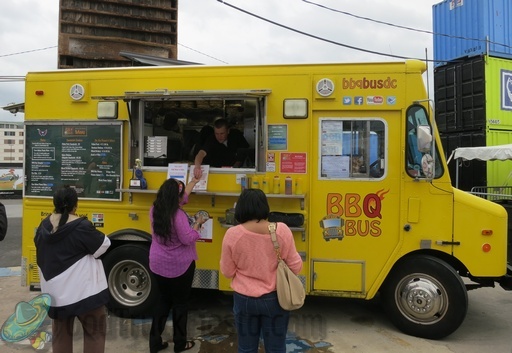 BBQ Bus has soft-opened as of April 9, 2011! They now serve the lunch time crowds daily as well as special events and late nights.